As my husband and youngest packed the car to go on holiday caught the 141 bus early to catch the very low, low tide this morning, aiming to return before my eldest teenager woke up. It was lovely down there today, the Thames was almost like a mill pond, although nothing can still that current ripping down towards the sea. Find of the day has to be a 300-450 year old almost complete salt-glazed stoneware Bellamine face. 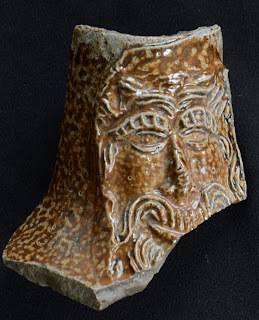 History and previously found fragments appear in an earlier blog post Bartmann jugs. My sister found one a month ago and I’ve been looking for an example since I began mudlarking, so really pleased to have finally captured this face. There were only 5 others mudlarking today. I met a lovely guy from Florida, who comes over once a year to mudlark on the Thames, when the tides are at their lowest. As I was leaving the foreshore another guy came over to show us these tiny very old cuff links. He’s been mudlarking for 32 years and had also found a few coins, clearly he has developed an expert ‘eye’. The coins still elude me and my Florida companion. Took longer to get home as city roads were closed as the crowds amassed to see the jubilee procession, so had to navigate through the back streets. As I walked up our steep road my phone rang, my eldest had just woken up ready for scrambled eggs on toast. Surfing the web this evening, I came across your Blog. I really enjoyed reading through it. The invasion of the Perutz slide holders.